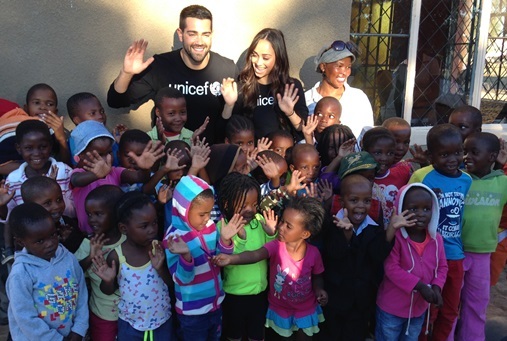 UNICEF Supporters Jesse Metcalfe, star of the TNT hit series Dallas, accompanied by actress Cara Santana, recently traveled with UNICEF to rural Botswana, where they visited several UNICEF-supported health care facilities and youth centers. The following are excerpts from their diaries of the trip. Jesse: At the district hospital in Kasane, we were able to speak with an 18-year-old new mother, and she seemed very thankful for the services and support she was receiving. Being the only fully equipped hospital in the district, it seemed surprisingly quiet. It was explained to us the difficulty many of the people in this area face just getting here, and how the hospital attempts to bring services to them, which can also prove difficult because of the great distance, terrain and lack of willingness due to certain stigmas concerning illness. Cara: We’ve spent two days visiting health clinics in the rural villages, and it’s clear how vital they are to these communities. They provide treatment for HIV and AIDS, malaria and tuberculosis. They provide postnatal care for babies suffering from malnutrition and dehydration. What resonated with me the most was the passion and spirit of the women on staff who have made their lives about the care of others. They were beyond impressive. 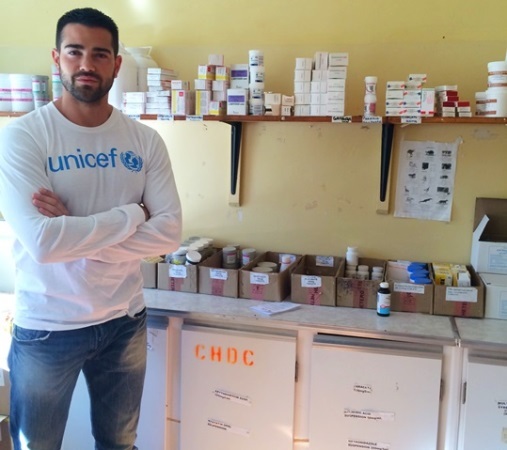 UNICEF Supporter Jesse Metcalfe visits the Pandamatenga Clinic in Kasane, Botswana where he observed how Child Heath Days are implemented. Jesse: We were allowed to sit in on a community meeting in the village of Pandamatenga. UNICEF, members of Botswana’s Ministry of Health and the village elders were there, with the village chief presiding. You could tell how motivated people were to make things better for their children. Cara: We went to a service center run by a local Catholic church an hour or so outside Gabarone. It was a place where children who lived in the squatter camps nearby could get food and shelter and continue their education. The children were so happy; I was deeply touched. In Mabutsane, Botswana, UNICEF Supporters Jesse Metcalfe and Cara Santana observe the impact of early child development programs on young children, a priority area for UNICEF in Botswana. Jesse: Not too far outside the capital, in the township of Naledi, we met a group of boys who had been living on the streets but were now receiving care, protection and other services at a youth center supported by UNICEF and its partners. There is tutoring available for the boys who are in school, and reading, writing and math classes for those who were not. They spoke to us about their hopes and dreams for the future. To me, this youth center is a model of what UNICEF can do and how incredibly effective it is. 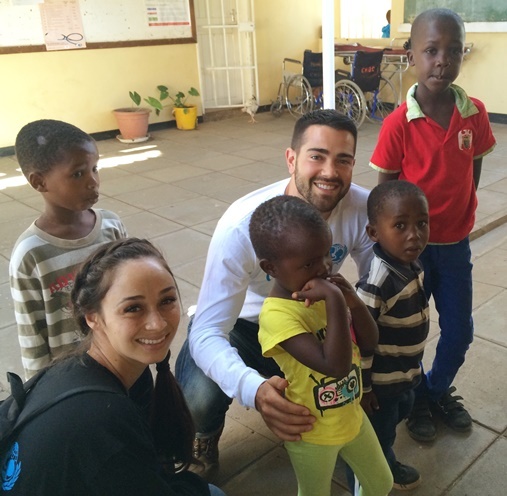 UNICEF Supporters Jesse Metcalfe and Cara Santana meet some of the children at a UNICEF-supported health clinic in Kasane, Botswana. Throughout this trip I have been incredibly impressed with UNICEF’s detailed approach to its mission, and how it brings together government and local agencies to help create lasting change. I already knew UNICEF was the most efficient and effective humanitarian organization on the planet; what this trip has really made clear is my role as a UNICEF Supporter. Back in the States I can promote the inspirational work of UNICEF. I can tell others about the wonderful people of Botswana, their strong sense of community and profound desire to improve their lives and the lives of their children. It’s easy to help people who want to help themselves.